Electric bikes are fast becoming the new favorite way to traverse across town. Proving to be very popular in Europe, their rapid upsurge in use has found a unique marketplace that contains a variety of niches. Your question now is probably going to be "what is an e-bike?" Quite simply, they are a regular bicycle with an addition of a motor and battery. Pedaling is still very much a manual process, however, should things get too difficult, that's where the electric motor kicks in and takes some of the burden off of you. Generally, an e-bike will have various settings that adjust how much assistance is given to you via the electric boost, so it can be configured as your journey progresses. Furthermore, there is a cutoff point once you reach a certain speed, whereby the motor will disengage, and the power will once again fall back to your pedaling ability. Today, we will be assessing a variety of affordable, all terrain off-road electric bikes to assist you with your decision. 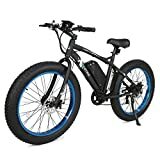 Let's start off with our top e-bikes in each category; these three bikes are the ones we would recommend to our friends and family. 1000 W of power is just insane to experience, and those fat tires help putting the power down! The best fat tire, all terrain, electric bike, and its not even close. ​ADDMOTOR comes in as the most expensive model in this review, and for that price, you are within reason to question just how good it is. The bike itself is centered around outdoor performance, with speeds of up to 30 mph claimed. Charging time is a reasonable 7 hours with the battery itself housed in a sealed pack, which is removable. Let's take a look at the specifications to get a better idea of how this e-bike stacks up. 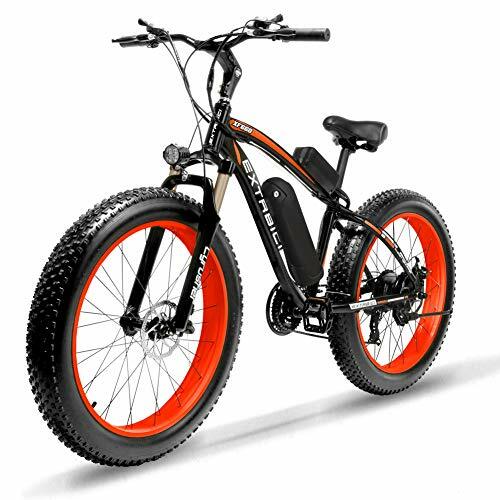 The Addmotor MOTAN M-5500 is a high spec electrical bicycle with a beast of a 1000 W rearhub engine that's capable of thrusting this electrical mountain bike at speeds up to 30 mph on pure electric power . 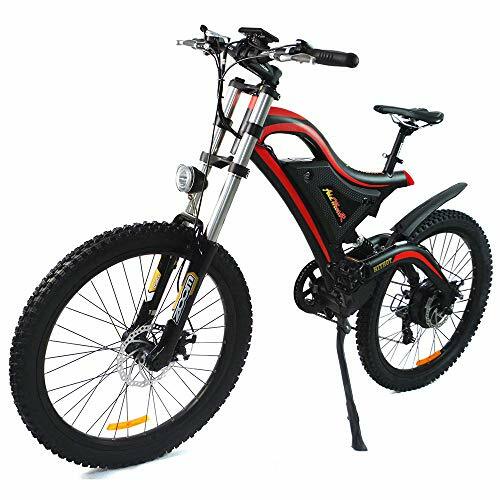 he MOTAN M-5500 was designed for men and women that want not just an eye grabbing electrical bike but something which packs all of the best part parts to provide a superb ride on almost any terrain. This e-Bike can accommodate passengers up to 350 Pounds in weight and it can travel at 30 mph with a range 55-65 miles on a single charge. This bike was a real pleasure to ride. I really felt like a kid again, and when you put down all 1000 W of power, the rear wheel skids a bit and you cannot help but feel overwhelmed with excitement and perhaps a bit of fear! If you can afford this ebike, and that's a big IF, as it retails for over $2500! The only reason why this bike did not get a 5-star rating, is due to its hefty price. 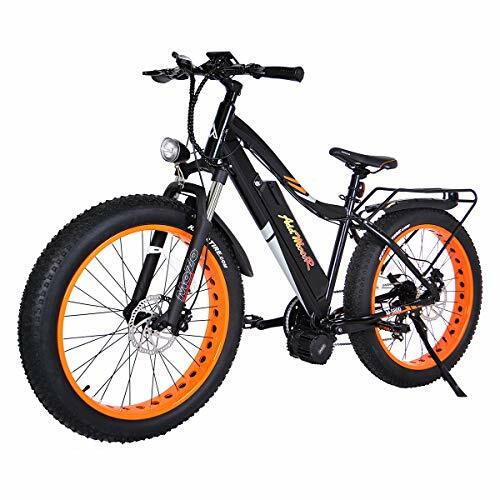 ​The Addmotor MOTAN M-5500 is a really competent electric mountain bike that's suited to almost any terrain, it is going to handle extreme mountain climbs, paths, unpaved or paved street and may be utilized in cities or towns such as commuting or entertaining riding. This e-bike features pedal aid & all electrical drive manners, a state of the art 6061 aluminium-alloy framework, 1000 W rear engine, a Shimano 7 speed SL-TX50-7R gears, MOZO aluminum 100mm travel suspension fork with preload, and TEKTRO HD-E500 hydraulic disc brakes. All of these nice features do add to the shipping weight, making this the heaviest bike in our review. The 'Flying Tiger' emblem on the framework is a unique commemoration to both the United States volunteers along with also the Aidhua Air Force cooperation from the World War 2. The big daddy of this review, if money is not a concern then just get this bike, you will love it. Is it worth paying double for this bike, probably not, unless you are looking to race! Our budget pick for 2019. Only downside is the basic LED display. One of ECOTRIC's budget friendly fat tire electric bikes, which comes with a nice matte black finish, this all-terrain and all-purpose e-bike certainly looks the part. Speeds of up to 20mph are stated which is achieved thanks to Shimano 7 speed gearing system and twist throttle. The frame itself is comprised of sturdy aluminium, giving a robust yet lightweight feel to the product. Big 26" wheels mean this is also suitable for the taller person and should be able to accommodate someone who reaches 6'8 in height. A bike that is aiming to be the best "bang for your buck", let's see how the specifics line up. A solid line lists of specs sets the ECOTRIC up to be a good purchase. Some encouraging user reviews gives an insight into how we feel about this product, that it is one of the best you can buy on a budget. With that caveat, however, there are drawbacks. It's not an all singing and dancing product, and there are a few things to note, such as the control not being on par with some other, more expensive e-bikes. This was again noted with other customers, one such review examined, that the controls are basic, incredibly so. Basically three buttons and some LEDs. No way to change the top speed and no way to see what kind of power you're drawing from the motor. It's important to note that this isn't a deal-breaking feature, rather just a footnote against the product. To conclude, the assertion when viewing this electric bike was that it could be a solution to your e-bike needs without costing too much. That's exactly what you get. It really feels like it should be priced higher, as the quality, comfort and ride are outstanding. Again as we noted, there are of course boxes that remain un-ticked, including the control not being as developed as a more expensive model. However, this is a nitpick blemish on a product that does what it sets out to do, while looking great and excelling in its remit. The verdict? A good budget bike, but some sacrifices were made. Buy this if you're on a tight budget or just entering the world of e-bikes and want a solid first one. All things considered, the great bike for the price. Great battery, an excellent frame, and over-performing range. A full tire suspension e-bike that is available in a myriad of colours, this is a special piece of equipment from the reputable Cyrusher that can do it all. Dual disk brakes are affixed to an aluminium frame that weighs in at just 56lbs this all-terrain all-purpose e-bike has huge 26" fat tires to assist with any routes. A very high speed of 25mph is stated, which blows away the rest of the competition and the battery distance is good for a solid 30-33 miles. What helps set this apart from the rest on our list is the suspension aspect, making it the one true all-rounder for any environment. Let's keep going and analyse the specifications before seeing how other buyers rated the product. Cyrusher also make a great folding electric bike, read more about it in our in depth-review. During my testing with this bike I can only say that this is a great e-fat bike. I purchased this bike and used it for my home to work commute. My commute is 6 miles one way so 12 miles round trip. After 12 miles, I had around 75% left in the battery on level 3 support, so I am pretty sure that the battery lasts more than 30 miles. What's key here is that the battery is lasting longer than expected, which is a great added bonus to be discovered. To expand, this e-bike can do it in other environments too, with a user commenting that it's especially handy for riding along the beach beside the surf and can even negotiate through soft, lumpy beach sand. The final piece of evidence comes in the form of great praise from one buyer who claims it is a super fun bike, does everything it's supposed too and looks good too. Everyone who rides it has a smile on their face. The only real downside are that the instructions are unclear and this could present a challenge for assembly. However, the company themselves recommend a professional should put this together for you anyway. All terrain, including city commutes, are easily handled by the fat tires, suspension, pace and battery life you get in this well thought out and fantastically handled creation. There's hardly any drawbacks, and the ones that exist are insignificant when compared to the huge amounts of positivity surrounding this bike. To surmise, we have a clear favorite and top choice for your e-bike. One that does everything and more, at a reasonable price it's an absolute bargain when you look at the marketplace. Stronger engine for the price, but poor suspension leads to uncomfortable city riding. A fat-tire electric bike from Onway that is striking in its presentation and has a certain "wow" factor about it that immediately sets it above the rest of the products we've seen thus far. An aluminium frame, similar to the product before it ensures a light weight of 60 pounds. Coming with an adjustable seat helps fit any rider, which is great for hitting as many potential customers as possible. The familiar seven-speed gearing system from Shimano is in play once more and again a top speed of 20mph is achievable. What catches the eye here is the maximum distance on a charge. A whopping 46 miles is the claim, which is almost double of what we've seen previously. The big difference here though is the LCD, which contains such information as the power being on or off, along with a 9 level assist mode. Rounding out the product are its 26" tires, giving this fat tire e-bike a familiar aspect of all purpose, all terrain. An exciting prospect, let's get into the detail and see how it lines up. • 46 miles max distance. Adjustable seat suits for any rider. 9-level assist LCD mode display will bring you a fun riding experience. As you can tell, this is a product that we're really high on, but do other customers have as much appreciation for it? What do the users say about this E-Bike? In the main, reviews are highly positive and contain lots of praise for how well it performs. One such review gushed, "This bike is a screamer...way way beyond my expectations. Solid build, efficient functions. And powerful Out of the box: 35 mph on flat paved streets with the throttle wide open and 200lb ride. A wonderful beast!" An outstanding remark that goes well with a great bike, but one that is not without its flaws. Due to the lack of full suspension, it's been discovered that this e-bike may not be suitable for city riding. While it's all-purpose terrain does mean it can perform well in other environments, it is worth considering this drawback before purchasing. This was also examined by another user, who explained that if live in a beach or a suburban area with smooth roads, then get this bike. If you need a bike for city riding, consider one of these with some shocks on it, like the ADDMOTOR HitHot reviewed earlier. This is unfortunate and not the only piece of evidence we have for this lack of handling in an urban setting, as another comment added that this bike for the beach, or snow, or suburban areas. This bike cannot handle city potholes and speed bumps very well because there is zero shock absorption on it whatsoever. It's all dependent on the tires and the seat. To wrap things up then, we have here the best fat tire electric bikes so far. Well priced at under $2000, you get everything you would expect and more from the Onway. The striking aesthetic does a great job at selling you instantly on this product's ability, and it almost has a tangible aura around it once assembled. Completely justified however are the negative remarks surrounding urban performance. An all-terrain bike should be expected to deal with potholes and the like. However, the lack of full suspension means this doesn't happen and poses somewhat of a problem. ​A great option, although the design is not everyone's cup of tea. Quality electric engine, battery and suspension. Another model from Addmotor, has come up with a design that is a little more budget friendly. Another electric fat tire bike, this one expects to be a solution to all your riding needs. From the park to the countryside and even the beach, the fat tires make all-terrain easily negotiable. A speed of 20mph is noted, and we'll find out soon enough if this is backed up. Although expensive, this bike gobblesup all terrain and off-road challenges. The frame is relatively lightweight, and with a low down design, it could be possible to perform some extreme maneuvers and stunts, should you want to get the adrenaline pumping. The battery is designed to be long-lasting and see you through a whole day of riding without any trouble, so before we find out if that rings true, let's detail the specifications and see how it looks on the surface. • Shimano 7 Speeds TX55 Gears Professional Transmission System. This is one of my favorite fat tire electric bikes, but the proof is always in the pudding and how have other users found it? The overall consensus is rather positive. With a electic motor supplied by Bafang (read our in-depth review about their electric motors here) and a excellent Samsung 48V 10.4A battery, Addmotor did not cut any corners in the key areas. Also, this is the only e-bike on the list that features a full spring suspension setup! that there are two relatively large crude holes drilled into this to allow wires to feed into the box. There is no plug or any other type of weather sealing around these. The front tire will spray water/salt/road debris into this whole. To review then, there is a lot to like about this bike. An alternative design that may not be for everyone's tastes, it has plenty to offer as a legitimate e-bike that can take you off road and on any terrain. You get a quality piece of kit that doesn't stretch the funds too much. The fact that an electric bike has a motor and battery doesn't mean it's a motorbike or scooter in camouflage. There are some differences between them. Firstly, an e-bike's main requirement is to assist the user with forward momentum, as opposed to a scooter or motorbike, which has the power provided independently. Typically you are limited to a maximum engine size of 250 W . Read more about these laws here. An e-bike speed limited to 25kmh (or 15mph). What's more, the motor found on an e-bike is not operated via a throttle as you would find on a scooter. Once again, this points to manual pedalling being your source of power. The average cost of an e-bike can be anywhere from 1000 to 3000 dollars. On the surface, this may seem expensive, but you can save lots of money in the long term. If we look again to the use of an e-bike for commuting, on average, your electric bike would cost 0.4 cents per mile to run. By comparison, an average sized diesel car would cost 34 cents per mile, so the difference is obvious. There are a few additional variations to consider for your all terrain e-bike. For starters, examine if it can fold up, so you can take it with you on public transport. Also, if you're going to be riding around the park, then you'll want to have an e-bike with good suspension forks. This will alleviate the impact of bumps and potholes, letting you ride with confidence. Now that we have a better idea of what to examine when purchasing an electric bike let's take a look at some of the various makes and models that are available right now on the market. Electric bikes are becoming more and more popular these days, and the demand is increasing for ones that can do it all, whether it's getting to work and back, or for traversing your favorite beach. There are also plenty of models on the market now, an increase from a few years ago, leaving you with plenty of choices that can cater to all needs. Usually, with these products, you get exactly what you pay for. Aim cheap, and you'll end up with something that won't make the cut and ultimately disappoint you and even cause you to buy something else, rendering the initial purchase pointless. Instead, open up the purse strings a little and glide to the bike we highly recommend, the Cyrusher Fat Tire Bike we reviewed last, but not least. Something that ticks all the boxes is the ideal scenario, and this is no exception. Fast, long charge, a suspension that can take all terrain (truly) and a great look, there's honestly no better way to get yourself into e-biking or upgrade your current model. Should you be looking for something different and more relaxed, take a look at our top beach cruiser reviews and see what takes your fancy! Boasting amazing high-end specs the Addmotor Motan 1000 W absolutely crushes the market competition! The Cyrusher puts the fat in fat tire electric bike, with 28" tires. And adds an excellent suspension package is worth considering if you wish to stand out and fancy something out of the ordinary.